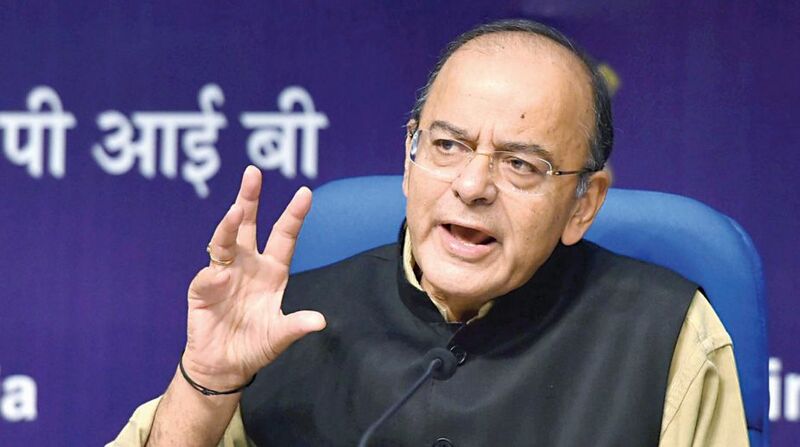 Jaitley’s response came after Congress had said that the Finance Minister is writing “hollow and wasteful” blogs to regain political relevance. War of words continued between Congress leader Randeep Singh Surjewala and senior BJP Arun Jaitley after the latter responded to former by saying “this is a political discourse. Abuse is not the answer. Please respond to the facts”. @rssurjewala – this is a political discourse. Abuse is not the answer. Please respond to the facts. He went on to add that India from being party of ‘fragile five’ and ‘policy paralysis’ to becoming world’s fastest growing economy could not be result “economic mismanagement”. Jaitley’s response came after Congress had said that the BJP leader is writing “hollow and wasteful” blogs to regain political relevance. Surjewala responded to Jaitley by saying, “[email protected] ji, When you abuse & berate the Congress leadership, even Supreme Court & many others by distorting facts,it is ‘political discourse’ for you, but when you are shown the ‘mirror of truth’ with hard facts,you get ‘unnerved’ & call it ‘abuse’? Politics of Convenience? (sic)”.
.@arunjaitley ji,When you abuse & berate the Congress leadership, even Supreme Court & many others by distorting facts,it is ‘political discourse’ for you, but when you are shown the ‘mirror of truth’ with hard facts,you get ‘unnerved’ & call it ‘abuse’? To Jaitley’s claim of India becoming world’s fastest growing economy after being in “policy paralysis”.
.@arunjaitley ji, Growth under Modi Govt is at 4 year low, Exports are in free fall, promise of 2 Cr Jobs is a ‘Jumla’,NPA’s are soaring to ₹10 Lakh Cr,Investment is down,Banks are paralysed & ‘Loot Scams’ a norm,GST flawed,Schemes failing! On Wednesday, Congress had hit back at the BJP leader for questioning the party’s “ideology” and its president Rahul Gandhi’s “wisdom”. Congress communications in-charge Randeep Surjewala said Jaitley’s blogs are a clear case of finding lost political relevance by “churning unadulterated lies”. He alleged that the “minister without a portfolio” is desperately trying to “outwit his juniors” who have surpassed ahead to “impress the Badshah by weaving blatant lies and falsehood”. Earlier, Jaitley while taking a jibe at Gandhi for “anti-Narendra Modi tirade” questioned the Congress president’s wisdom, saying it has to be acquired through learning and cannot be inherited. The Congress party has become “ideology-less” because its “only obsession is a person called Narendra Modi (prime minister)”, Jaitley said in a Facebook post. Surjewala dubbed Jaitley as the “worst” Finance minister in India’s history who pushed a resilient Indian into an unprecedented financial gloom. The economy under Jaitley has become the biggest NPA (non-performing asset) for the country, he said. “Myopic memory, selective amnesia and weaving lies have become the characteristic style of Modi government’s minister without a portfolio Arun Jaitley. “We understand his desperation of seeking political relevance by writing hollow rhetoric, unadulterated falsehood and plain distortion of facts through his hollow blog,” the Congress leader said in a statement. “Has the BJP and Shri Jailtey become agenda-less, achievement-less and argument-less?” he asked. Instead of worrying about job creation, providing adequate MSP to farmers and national security, the prime minister is busy throwing “fitness challenges” and putting odd videos on social media, while Jaitley is busy writing some hollow blogs, he alleged. “The Congress wants to remind the prime minister and Jaitley that they have ruined this country’s economy through their Modinomics + Jaitleynomics, and this country now needs a break from them,” Surjewala said. “In dynastic parties political positions are heritable. Unfortunately wisdom is not heritable. It has to be acquired through learning,” he said in a post titled “Is Congress Becoming Ideology-less? Is Anti-Modism its only ideology?”.